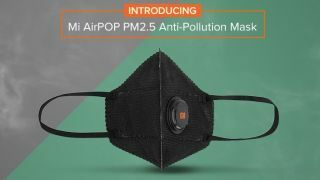 Xiaomi releases Mi AirPOP PM 2.5 mask in India. Earlier, we reported that Xiaomi might roll out the Mi Purely Air mask in the country today, but the recent tweet has confirmed that it’s the Mi AirPOP PM2.5 Anti-Pollution Mask that goes on sale at 12 PM today on Mi India website. The mask comes in a pack of two priced affordably at Rs 249, which makes it unlikely to come with the three level fan and N95 filter as the Mi Purely Air Mask. Instead, there is a vortex valve that discharges warm air and vapor while restricting the pollutants to enter the mask. As the name says it’s a PM2.5 mask, it means it can achieve PM2.5 filtration. The company claims it can protect users from 99% of bacteria, pollen, and particles which are as small as 2.5 micrometers. In simple words, it should remove most of the dust and debris present in the air. It has four layers of filtration and soft and skin friendly fabric for a snug and comfortable fit. As of now, it is available only in black color. It weighs just 32.2 grams and lasts for three years if the packaging is left unopened. Each mask can be used for 15 hours, which means if you're using the mask for one hour a day, the pair should last you a month. Looking at the rising pollution levels in India, it is a good investment if you are a daily commuter.